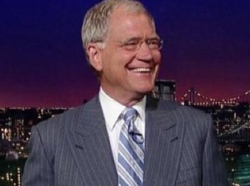 David Letterman is getting into the music business. His production company, Worldwide Pants Inc., has formed its own record label and it already has its first act. Clear Entertainment/C.E. Music will release the debut album from the punk duo Runner Runner this summer. Their self-titled album is being released through a new partnership with Letterman’s label, EMI Music’s Capitol Records and MRV label. The band, from Huntington Beach, Calif., will begin touring next month.